In June 2007, Drambuie, the scotch whiskey liquor made famous by its association with Scottish legend Bonnie Prince Charlie, started to plan for an adventure race across Scotland. The event was designed to help promote the spirit to a younger, upwardly mobile, mostly-male target audience. Drambuie, along with its US AOR Maloney & Fox and UK agency Shine Communications, developed the Drambuie Pursuit, a one-day, 100-mile race across Scotland for 10 teams of four. 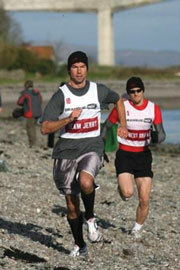 Actor Jerry O'Connell joined the effort, serving as spokesman and leading a team in the Pursuit. "He was appealing to the kind of guys we were trying to target, as well as having a more widespread, mainstream appeal," says Joe Delaney, regional director for Drambuie US. To promote the drink, and to get consumers to sign up to compete, Drambuie hosted Drambuie Dens (pop-up bars) in cities across the US, including Columbus, OH; New York; Denver; and Milwaukee. "Between June of 2007 and April of 2008, we rolled out a national campaign that mixed normal media relations both for the product and the... Pursuit with the experiential activity for the Den," says Giles Hanson of Maloney & Fox. The effort also included online outreach, Hanson says, focusing on the registration Web site. More than 500 teams signed up online and the team handed out 6,000 samples at various events. The event also generated more than 900 individual media placements, including ESPN, National Geographic, and Extra. Drambuie is working on the second Pursuit, scheduled for April 2009, and is currently working on finding a celebrity spokesperson.